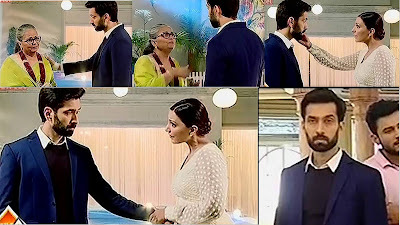 Segment Start With Ishqbaaaz’s New Story Where Dadi’s Character has been Changed and She Wants Shivaay to Marry Tia Who is In Positive Character in New Story. Shivaay Gets Agree Only because of His Dadi But He has an idea of Postponing This Marriage. Tia Listens to His Conversation with Dadi and She comes to Him and tells Him That She Knows You don’t love her and She is Just Friend for him But For Her You are Everything. She Takes Shivaay’s Hand in Her Hand and Tells Him That After Marriage I am Sure You will Fall In Love with me. She Touches Shivaay’s Cheeks and tells him That I Love You Shivaay But Shivaay Just Looks at her and Says Nothing and Leaves from There. Shivaay doesn’t want to Marry Anyone Because of His Parents Unhappy Marriage. Shivaay’s Dadi is Unhappy with Him because of His thinking about Marriage. Shivaay Bribed Pandit and Pandit told Dadi that there is no Good Mahurat for Marriage and that’s why we should Postpone Shivaay and Tia’s Marriage. Tia’s Interview: She Says Just Like Ishqbaaaz Reloaded I am Reloaded with Positiveness and You will Love it. She Adds that We Women have Our arm that is Emotional Blackmail and I did with Dadi Lets See Shivaay will convince or not.